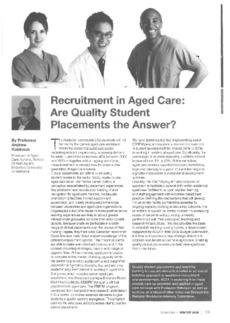 eCite - Recruitment in aged care: are quality student placements the answer? Recruitment in aged care: are quality student placements the answer? The Australian community's future needs will not be met by the current aged care workforce. Within the residential aged care sector, escalating resident dependency, a growing demand tor beds - predicted to increase 40% between 2007 and 2020 - together with an ageing workforce, mean investment is needed now to recruit a new generation of aged care nurses.